Next week the 6th edition of the Embedded Vision Summit will be held in Santa Clara, CA. We’ve seen a significant increase in the adoption of computer vision technology in consumer electronics, automotive and other electronics since 2012 when the first summit was held. The same holds true for the conference. This year we’re expecting over 1000 application developers, business leaders, investors and entrepreneurs to attend – all focused on embedded vision. You should be there too. We’re looking forward to seeing you there, and if you haven’t registered yet, we can offer a 15% discount when using the code Videantis16. Just as cars replaced horse carriages in the 1920s, electronics will replace the human operator in our cars in the 2020s. The benefits are tremendous: self-driving cars save lives, save time and save cost. For car manufacturers, change will be gradual. With each new model year, they’re adopting increasingly sophisticated advanced driver assistance systems (ADAS) that aid the driver, instead of taking full control. In his talk at the summit next week, our VP Marketing Marco Jacobs will provide an overview of the state of ADAS today and give a glimpse into the future. Let’s set up a meeting and discuss how you’re addressing this opportunity. 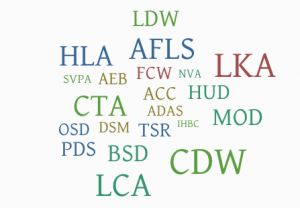 There are many acronyms in use in the automotive ADAS world. In order to make things easier for you, we’ve been keeping a list with explanations on our website since the fall last year. Here’s to let you know that we’ve just updated our list and added more explanations. Just like before, please don’t hesitate to contact us if you have more information that you’d like to see added to this overview. Embedded Vision Summit May 2-4, Santa Clara Come see our demos and talk at the key embedded vision event of the year.